The Killinger Foundation was founded in 1979 by Walter Buechele, Jim Holt, Bill Iacone, Joe Iacone, Emil Messikomer, Jr. and John Slawek with a mission to contribute to the future success of the West Chester University football program. For more than thirty years, the Killinger Foundation armed with volunteers raised funds which were given to the University and earmarked as financial aid in the form of scholarships for student athletes in the WCU football program. The Killinger Foundation is operated by the Board of Directors who are made up of a volunteer group of former football players, coaches, friends and alumni. The Killinger Foundation Board of Directors hosts the Annual Homecoming Social before the homecoming football game and the WCU Football Hall of Fame. 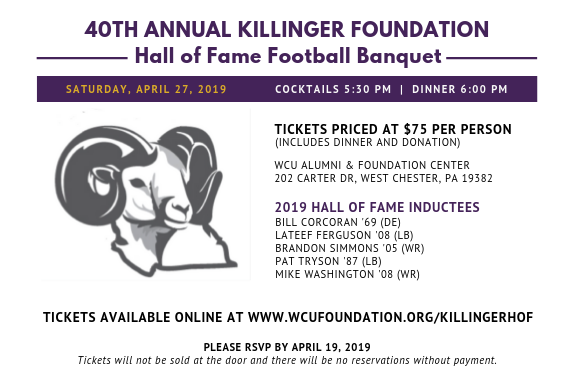 Join WCU football alumni and football program donors at the annual Killinger Foundation Football Banquet and Hall of Fame induction dinner on Saturday, April 27th at 5:30 pm.